I went to test drive cars today. My final decision was on these 2 cars. Holden Astra & Mazda 3. 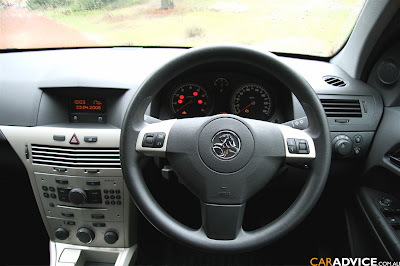 At 1st, I thought I will end up with Holden Astra but, once I sat into Astra, I was shock to see the interior design of Astra. It was dissapointing! I'm not good at cars, but I just hate the design of it. No matter what the deal is, I just can't take it. Which part of it that I hated? The middle part, where the CD & air cond buttons is. Look at the buttons.. the design look so rough and plastic-ky. The buttons look like calculator. It just look so flat and unappealing. No doubt, exterior is great, but interior is just bad..
As for features, it was alright. Comparible with other cars. To be honest, after days and weeks of research. I found Mazda 3 is the best of all. Within my price range, design and the electronics. This is the best car ever. It has everything that I wanted. There is nothing to complain about. The test drive that the dealer gave us was awesome. I have no words for it. He showed us the stability of the car, the efficiency of the breaks, and the smoothness of the drive. The way he drove was just impressive!! Feels like i'm in Initial-D the MOVIE!! one word.. AWESOME! Never thought MAZDA 3 is soooooooooo good!! No wonder this car is so popular. After testing it, I just feel like driving that car home straight away. My heart beat rose, my eyes were on the MAZDA 3, my brain just froze. I NEED TO HAVE THAT CAR. Include: Spoiler, alloy wheels, safety pack, Ipod cable, slim-line weather shield, and tinting protection & etc. Hell yea! Like what my brother told me, PIMP YOUR CAR! I'm pimping it obviously! My first owned car! heeheh.. I'm gona dream about my car tonite. Can't wait till next week! P/S: Thanks Joe for the great help!!! Muaks! Printer can make beautiful art too!! !